The nominees for the 2018 Broyles Award, which honors college football's top assistant coaches. Broyles Award announces 2018 nominees — LITTLE ROCK, Ark. – (Broyles Award) – The Frank & Barbara Broyles Foundation is pleased to announce the nominees for the 2018 Broyles Award, which honors college football’s top assistant coaches. The 53 nominees in this year’s class were selected from approximately 1,500 assistant coaches representing 130 Division One programs across the country. The Broyles Award selection process includes the Football Writers Association of America (FWAA), a college football hall-of-fame selection committee and current college head coaches. 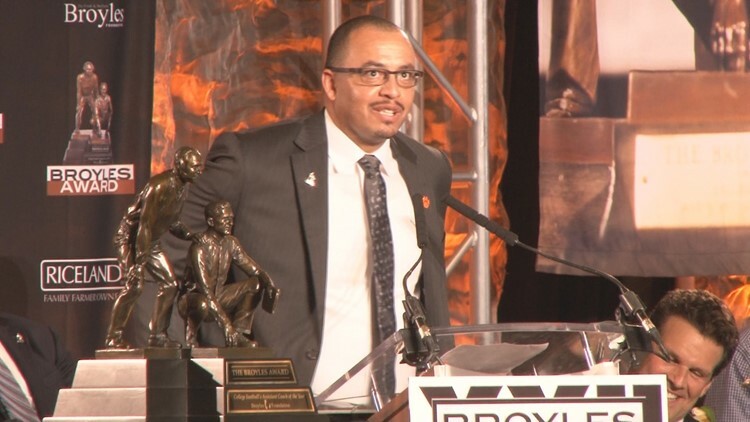 The winner of the 2018 Broyles Award was Tony Elliott, co-offensive coordinator and running backs coach at Clemson. Winners from the past five seasons are not eligible to be nominated for the Broyles Award.